You don’t need to be a professional race car driver to appreciate a fast and productive pit stop. Whether you’re on your way to a meeting, shuttling a caravan of hangry tweens to a soccer match, or headed out for a cross-country road trip, getting in and out of a gas station as quickly and efficiently as possible is crucial to enjoying the rest of your day. Here’s how to get it done. It’s easy to get distracted when filling your tank. Sometimes you’re so busy trying to watch the pump and keep the kids from honking the horn that it can be hard to remember all the things you need to accomplish at the gas station. 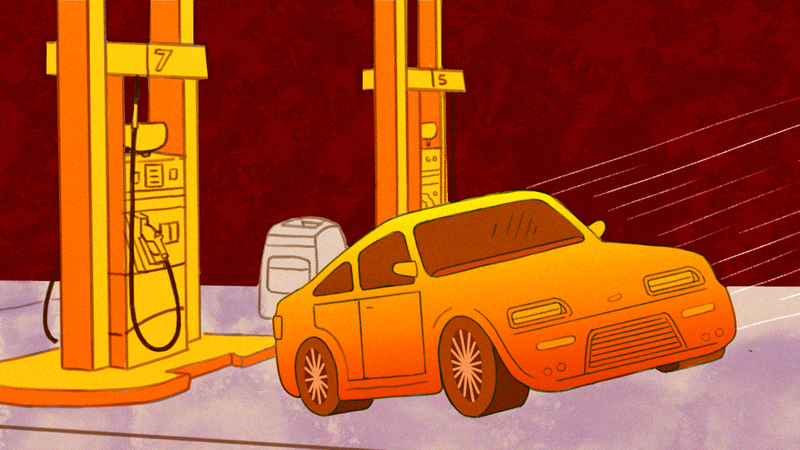 So ask yourself a few important questions: Do I need a full tank? Is anyone hungry? Do I need anything from the convenience store? Do I know where I’m headed after this stop? Answer these questions before you even drive up to the pump and it’ll make the whole trip smoother. If you’re only using the gas station to refuel your tank and grab some quick grub you’re not getting all you could out of your trip. Take this brief opportunity to do some maintenance on your car. Wash your windows, check your tire pressure, and (if you’ve got an extra two minutes to spare) plop a few quarters into the vacuum and give your ride a quick clean. You’ll head off to your next appointment with the peace of mind that comes from a well-cared-for, tidy car, and you did it all while you’d normally just be staring at the nozzle. In a world of frozen slush drinks, triple-dusted cheese chips, and hotdogs tumbling on a heating rack, it can be hard to find the perfect snack. But if the kids are hungry no one’s happy, so hit the convenience store with a purpose and get good snacks that will fill and satisfy even the pickiest little eaters. In general, stick to healthy snacks for the kids like low-sodium jerkies and fresh fruit. While you’re at it, you can quickly craft up fun little custom snacks by combining things like crackers, pretzels, and nuts with peanut butter snack packs or yogurt cups. Grab a bite for yourself, too. Saving money at the station means more than just avoiding tchotchkes and keychains with your name on them, it means getting the most out of your purchases while you fill up. Use a credit card to snag some extra savings from cash back rewards on gas and look for the station’s specific promotions. Want to save even more? Try fueling up and buying in-store purchases with the new Shell App, which earns you twenty-five cents per gallon in Fuel Rewards® program savings that come right off the cost of your purchase when you download the app and make your first fill up. After that, you’ll save five cents per gallon every day at Shell. Need batteries? Sunglasses? Toothpaste? Extra cash from the ATM? Chances are good that the gas station and convenience store have what you need, so you can save yourself an extra trip to the store. You’ve got enough errands to run in any given day, so shave a bit off that ever-growing to-do list. This post is a sponsored collaboration between Shell and Studio@Gizmodo.